Augustine Sackett served during the American Civil War as an assistant engineer in the Regular Navy. 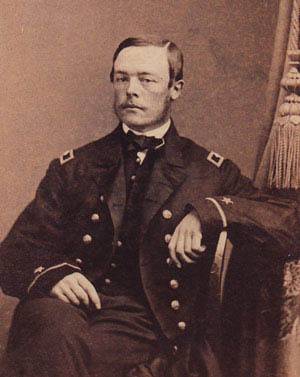 Augustine Sackett served during the greater part of the war for the preservation of the Union in the Regular Navy, as an assistant engineer, doing duty as such in the ships Wissahickon, Chippewa, Algeciras, Spain, Ascutuey and Mallabessett. He was with the Gulf Squadron in the blockade of Mobile and capture of New Orleans; was with the North Atlantic Squadron in the sounds of North Carolina; was in the Roanoke River service, and in the conflict with the Confederate ram Albemarle. At the close of the war he resigned from the service and has since resided either at Lee, Mass., or New York City. Charles Weygant, The Sacketts of America, "3941. Augustine Sacket, b. Mar. 24, 1841; m. Charlotte G. Rice." Vital Records, Lee, Berkshire County, Massachusetts, v235, p53, marriage "June 8th 1871, Augustine Sackett, of Lee, 30, paper colar manf, b. Warren Ct, s. Homer & Flora Sackett, first m., & Charlotte G Rice, of Lee, 23, b. Wayland Mass, d. Abner & Nancy G Rice, first m. Married by Rev V Gale, Cong. Clergyman." "Historical Newspapers, Birth, Marriage, & Death Announcements, 1851–2003", digital image, Ancestry.com, Boston Daily Globe, 12 September 1908, "Abner Rice, Lee, Dead. / Town's Leading Citizen Lived to Age of 88 Years. / High School Principal for 31 Years and a Representative. / Lee, Sept 11—Abner Rice, 88 years old, Lee's most prominent citizen, died this morning after a brief illness. ... He is survived by the following children: Mrs Augustine Sackett of New York, ...."
Kerney, Margaret, 18, f, b. IRE. [in public house of Edwin Morgan]. Sackett, Margaret R, dau, b. Jul 1880, 19, single, b. MA, father b. CT, mother b. MA. [sic: she was single; enumerator's error—"m. 8" applies to next person on page], b. NY, father b. CT, mother b. MA. Sackett, Edith R, dau, 44, single, b. NY, father b. CT, mother b. MA, occ none. Advertisement, Country Life in America, researched by Len Sackett. Website National Inventors Hall of Fame (http://www.invent.org).